According to 'Lip Balm Anonymous' , lip balm is addictive. I totally agree. Would I ever want to go cold turkey? EOS Lip Balms ($19.50 for both)~ These lip balms are 100% natural, 95% organic, paraben and petrolatum free. Packed with antioxidant-rich vitamin E, soothing shea butter and jojoba oil. You know I'm a sucker for cute packaging. These are some of these cutest things ever! 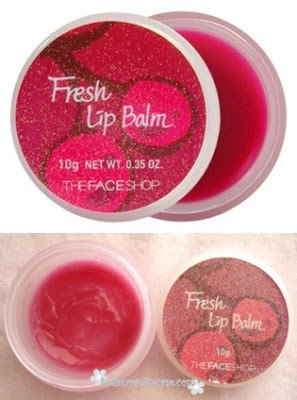 (They remind me of Easter eggs and litchi =) ) Plus, they do moisturize my lips very well and don't wear off quickly. I like that the texture is almost matte and doesn't make my lips look glossy, which makes it easier for me to put a lippie on top. I'd say both flavors are equally nice and will definitely get Sweet Mint and Lemon Drop too later. Bourjois Baume De Nuit Night Lip Balm (Rs.420)~ What it is: Your night time prescription-a tinted lip balm which restores lips while you sleep. The formula moisturizes and restores lips all night long, filled with emollient oils & repairing agents. The creamy texture makes your lips look visibly repaired and nourished in the morning. Let your night time treatment work while you sleep! This is my favorite lip balm. It doesn't look fancy, but it delivers. Somewhat like a not-so-attractive or glamorous-looking hairstylist, who always does a better job at doing your hair than the other glam hairstylist with the perfect locks and trendy outfit. It was the only thing that helped when nothing else seemed to work. It has an unmistakable extra virgin olive oil smell which doesn't bother me. I will have to stock up on these because Bourjois seem to discontinue a lot of their products without prior notice. I do prefer this lip balm to the Body Shop Lip butters. The question in my head is, why that 'meh' blue packaging?! Don't you think pink (or even peach) would've suited it more? The Face Shop Fresh Lip Balm RD 301~ Mouth watering fruit scented and flavored lip balm softens and comforts your lips with natural fruit extracts, vitamin E and jojoba oil. Has a sweet cherry scent. So, any other lip balms you think I might love. Do let me in on your favorites. The first one is so cute look like egg. eos lip balm is so cute! i use banana boat's lip balm. 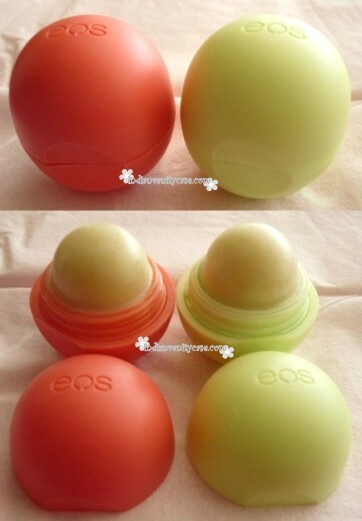 I really wanna try one of those eos lip balms, where can i find this? omg.. i wana get my hands on those EOS balms! any idea as to where i can get them?? :) i recently got korres quince lip butter. have yet to try it on... but my current fav would be Nivea. i've been using the pink grapefruit one for years! I hope the Bourjois ones are available here..**fingers crossed**..and yeah..pink or peach would have made a much more lovely packing. Those lip balms are so cute! I love the way they are packaged. I am still in love with my Korres Jasmine lip butter, even though some bloggers think it is overrated. It works well for me! Thanks for sharing your faves with us, Cynthia! Of the ones you've listed, I've only tried the EOS. My favorite thing to moisturize my lips is Aquaphor. Oh, I've been lemming the EOS lipbalms for the longest time! The word cute can't even begin to describe it! But of course, it's what's inside that counts and this one seems to tick all the right boxes. I live in the US and am trying to get ahold of the Bourjois night lip balm. if you know where I can get one please let me know. I am desperate. I have horrible chapped lips and have tried everything!